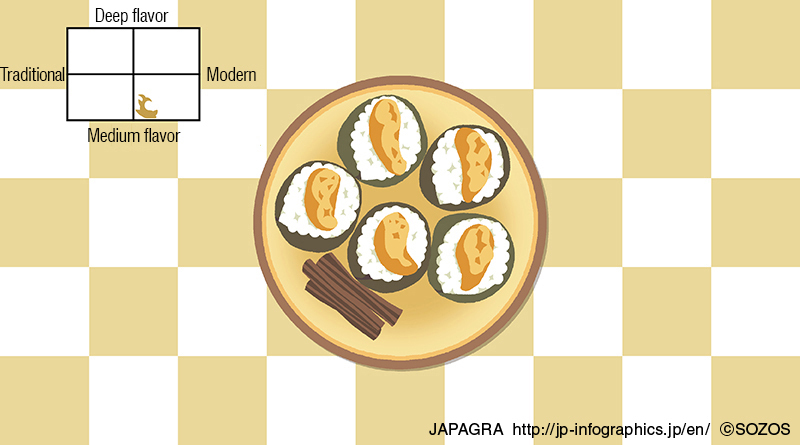 Enrolled in UNESCO’s Intangible Cultural Heritage, “Japanese food” is very much up-and-coming in the world. 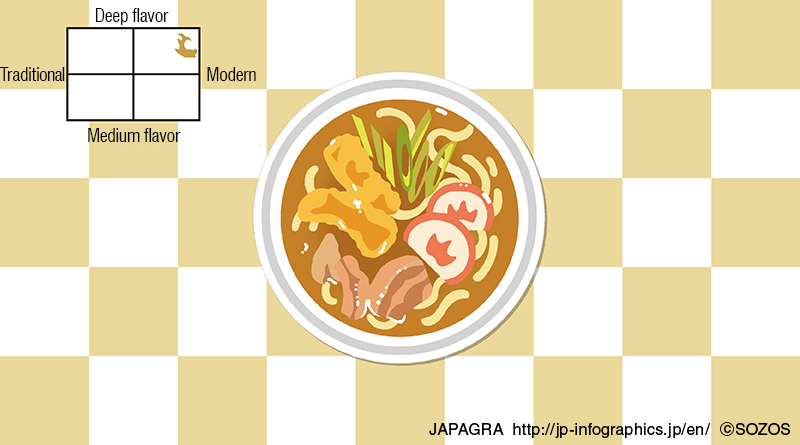 Among the various Japanese food cultures that took root all over Japan throughout history, Nagoya Meshi (Nagoya’s Famous Food) stands apart from the rest. Dishes such as Fried Pork Cutlet with Miso Sauce, Eel and Rice Soup, and an overwhelming abundance of other dishes original to the area. 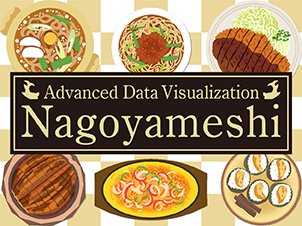 Now, we’ve rendered the rich history of the taste of such Nagoya Meshi as Infographics! One of the ever-popular meals of Nagoya cuisine, and representative of their bean and miso dishes, is Misonikomi Udon. When opening the lid of the earthenware pot that’s come to a boil, you are greeted with the rich fragrance of bonito and shitake mushroom broth combined with bean miso. This brings out an exquisite taste in the semi-hard noodles, even when stewed. Although there are varying opinions as to its exact origin, the dish was created in approximately 1603. Kishimen are broad, flat dried noodles in a soup of Tamari soy sauce and sweet sake. 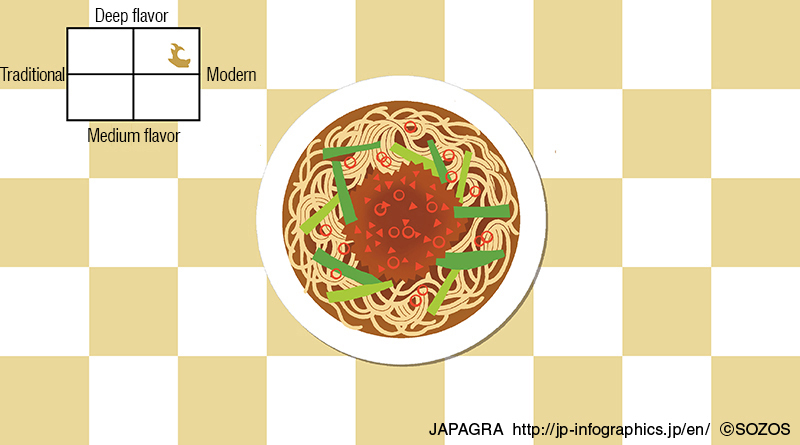 These simple noodles have a thickness of less than 2 millimeters and width of more than 4.5 millimeters. 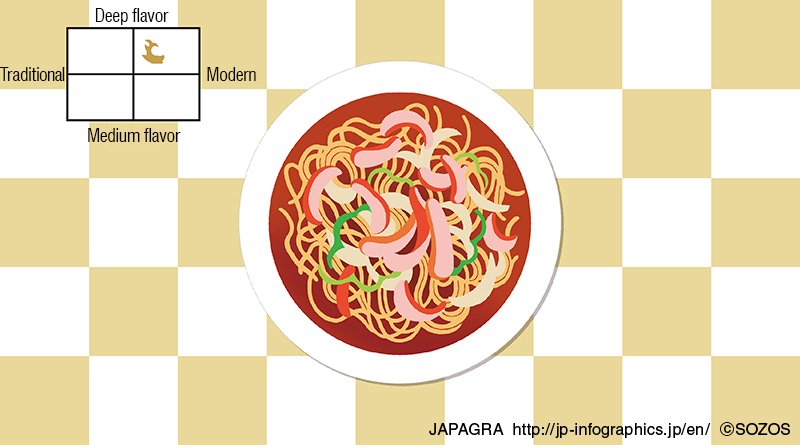 Again, this dish’s exact origin is unknown, but the popular theory places the quick-cooking noodles’ beginnings around 1603 to feed the always-hungry stomachs of those working on construction of the Nagoya-jo Castle. Doteni is a dish of beef giblets simmered slowly and carefully in bean miso and sweet sake. The combination of the giblets with the bean miso produces a sweet and spicy flavor which is the thickest of all Nagoya meshi. This addictive taste goes perfectly with alcohol and rice. 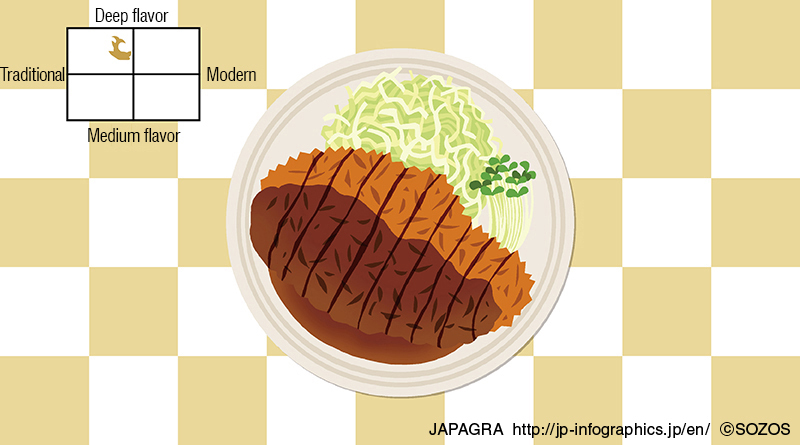 This dish became popular with the masses after eating meat became a more common part of the japanese diet around 1868. Nagoya Cochin is a local breed of chicken famous across Japan. It is lean and tough with a deep body flavor, and the breed’s origin can be traced back to a retainer of the Owari feudal clan in about 1868. We can enjoy the chicken barbecued, or soy-and-sugar seasoned, atop a bowl of rice with eggs, vegetables and minced meats. But if you want to enjoy the chicken’s natural flavor, Kochin Nabe is the best choice. Reigning supreme over all Nagoya mesh is Hitsumabushi. Finely sliced eel, baked Kansai-style served over rice, and dating back to around 1868. In addition to the rich flavor of the sauce and pleasing scent of the eel, this dish features a variety of ways to eat it in a single sitting. First, the eel over rice, followed by adding seasonings like wasabi and leeks, and finally, by pouring a broth over the eel and rice. 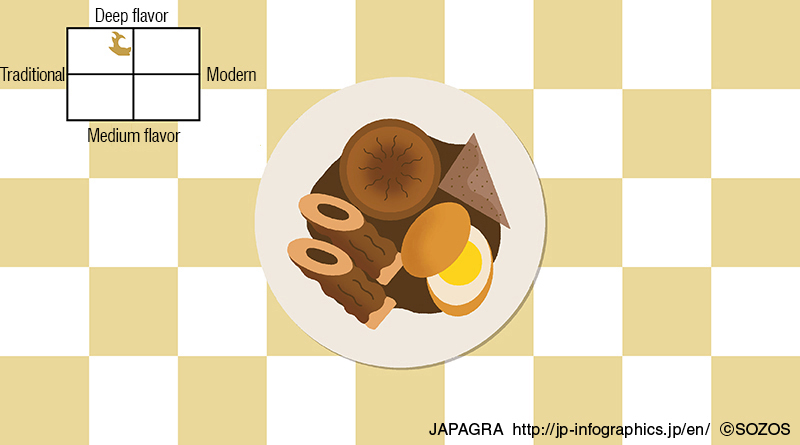 Ogura Toast is a popular Nagoya coffee shop staple, loved by people of all shapes and sizes. 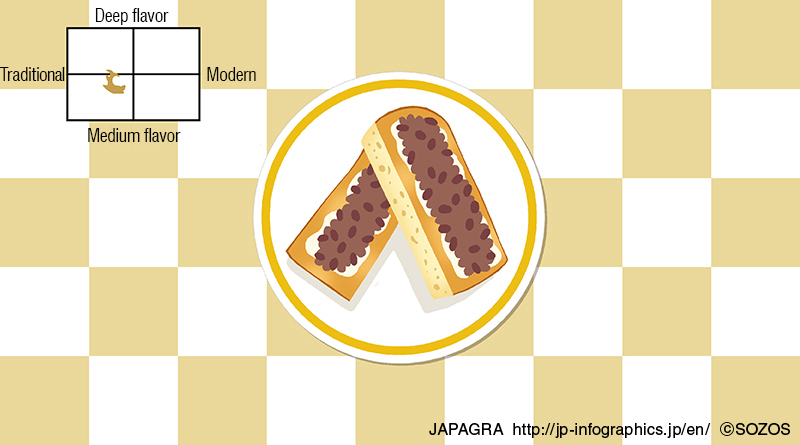 It is toast with butter and red bean paste, with an exquisite sweet and salty flavor. It originated in 1921, when a schoolboy dipped his toast into a Zenzai (red bean paste) soup, which was witnessed by a coffee shop’s proprietress, who then developed the dish. Depending on the cafe, the dish may be served as a sandwich, or with the red bean paste on the side. Nagoya’s Oden (vegetables, fish dumplings and various other ingredients of food stew in a soy soup, served hot) can be hard to see for the first time diner because the soup is so thick and dark. But the soup’s flavor come from soy-miso and boiled daikon and eggs have a slightly light and sweet taste. 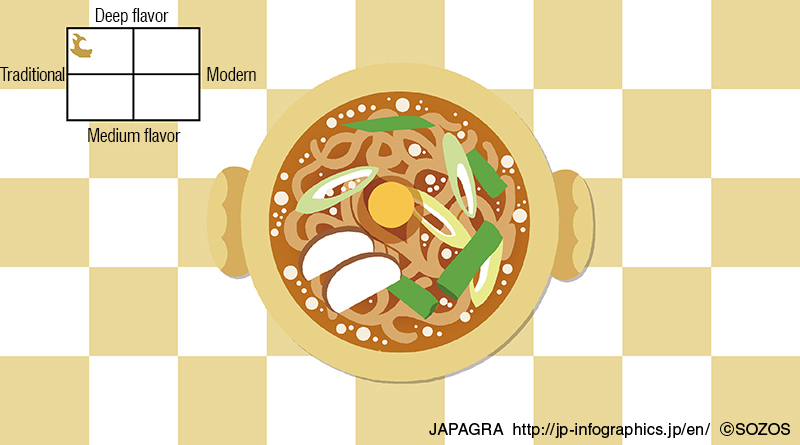 Dating back to around 1945, there were originally two basic styles of Oden: The first being Kansai-style, which is boiled ingredients in a thin broth, eaten with miso sauce. The other being Edo-style, which is boiled in dried bonito stock, soy sauce, sugar, and sweet sake. In Nagoya, these two styles were combined and developed into something original. Miso-Katsu, which is a pork cutlet served with a sweet miso sauce, is a favorite of the people of Nagoya dating back to around 1945. 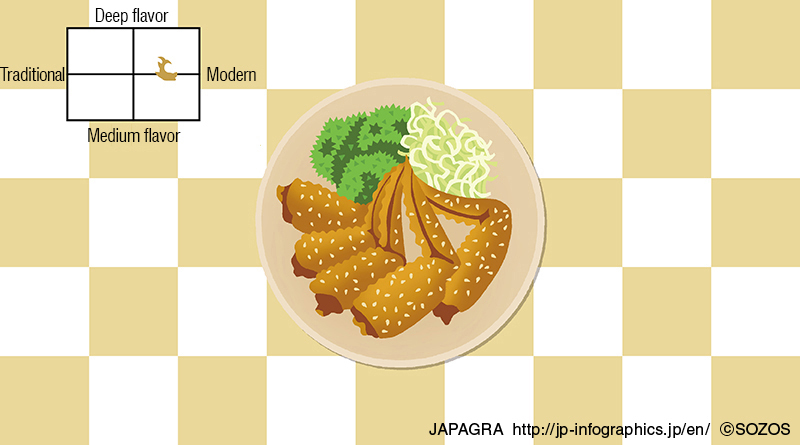 Originally, cutlet deep-fried on a spit and served with a Doteni sauce, the people of Nagoya, who have a history of creating new kinds of dishes from disparate ingredients or existing dishes, combined the cutlet with Miso sauce. The miso sauce differs from restaurant to restaurant from thick to thin, so patrons can enjoy discovering their favorite taste. Ten-Musu is a small rice ball with shrimp tempura, and prepared to be served to-go. The texture of the shrimp tempura combined with the rice ball’s salty seasoning produce a wonderful harmony, excellent for lunch, a snack, or as a gift. It was developed back around 1955 by the hostess of a Tsu-city restaurant in Mie prefecture who was too busy to cook a full tempura lunch for her husband, and so cut the shrimp tempura and made rice balls with them. Ankake-spa is a thick, fried spaghetti dressed with a thick, starchy sauce, made from broth of meats, vegetables, and black pepper. The result is spicy and very addictive. There are two basic styles served: ‘Milanese’, which has a stronger meat flavor, and ‘Country’, which favors a vegetable taste. You can also choose a combination of the two, and enjoy the flavors of both, in addition to added toppings. Created by the original proprietor of a pasta restaurant sometime between 1955-1965. 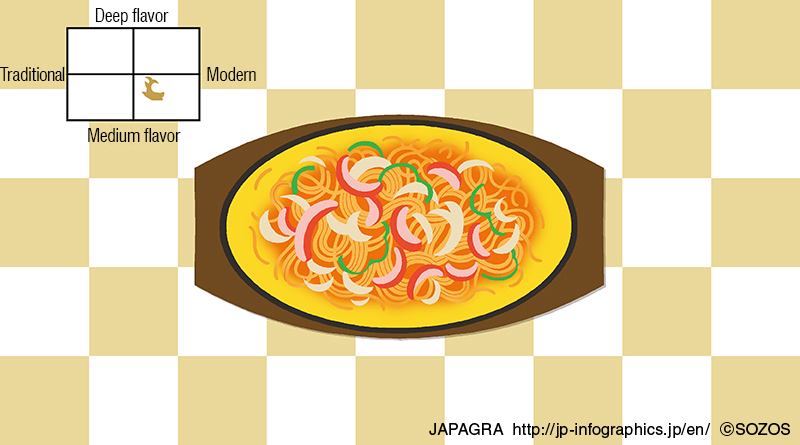 Teppan-Italian is a Nagoya-original dish equal to Ankake-spa. Tomato-flavored spaghetti served on a hot iron plate atop sizzling eggs. Ingredients include sausage and green peas, creating a flavor people in Nagoya long for. This dish was created in 1961 by the original proprietress of, developed because she didn’t want it to become cold when served. Tebasaki is a chicken wing dipped in a sweet-spicy sauce that is almost impossible to stop eating. This dish is a staple at izakayas in Nagoya. Its origin dates back to 1963, when a chicken specialty restaurant, ‘Furaibo’s’, proprietor made this meal instead of using chicken thighs, becoming very popular. Another restaurant, ‘ Sekai no Yamachan’, developed an original sweet and spicy sauce based on Furaibo’s, which became a favorite of foreign diners. Created in Nagoya, people say, “Really spicy, but so delicious!” coming back again and again for more. The base soup is made from chicken bones, soy sauce, garlic and red peppers. Toppings include fried minced meats and Chinese chives. This ramen was first created at a Taiwanese restaurant, some time between 1965-1975. The proprietor, who came from Taiwan, based this noodle on ‘Tantsu Noodle’, a Taiwanese-original dish, creating a very spicy ramen. This is an extremely spicy dish, so if you have a low tolerance for spicy foods, you may want to order “Taiwan Ramen American’, a milder alternative. Nagoya’s Curry Udon is thick udon noodles served in a deep curry soup, creating its characteristic rich and creamy taste. Developed around 1975-1985 by an Udon restaurant, basing their curry on that of a speciality curry restaurant’s, and becoming so popular that it’s become many restaurants’ signature dish. It’s fun to discover a Curry Udon restaurant that suits your taste best. 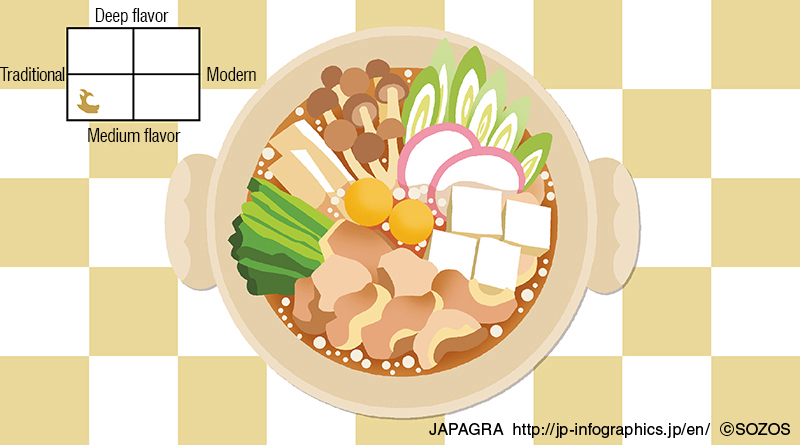 Let’s enjoy the flavor of Nagoya Meshi! 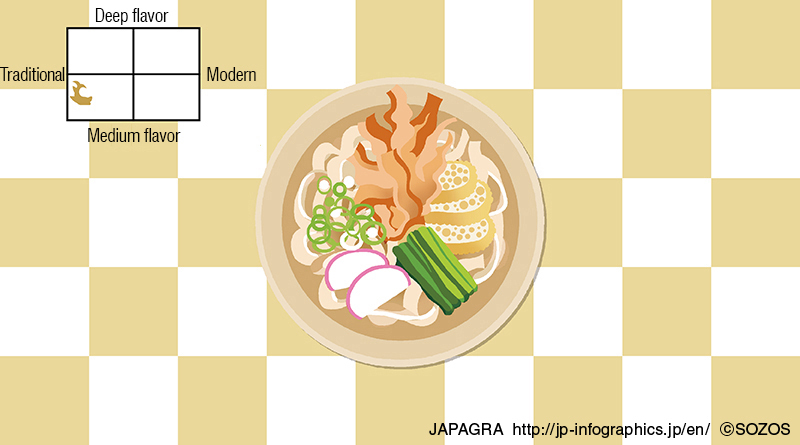 The greatest point of Nagoya Meshi’ is the variety of dishes, rich in originality, that the locals eat daily. The bean miso and soy sauce used in the majority of Nagoya-speciality dishes are made only in the Tokai region, creating a treasure trove of taste. 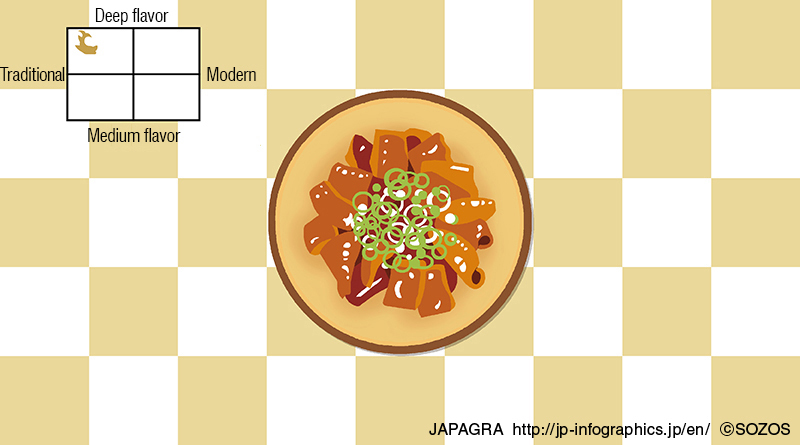 Nagoya Meshi’s wide variety of original foods are represented by their “Umami”* flavor. 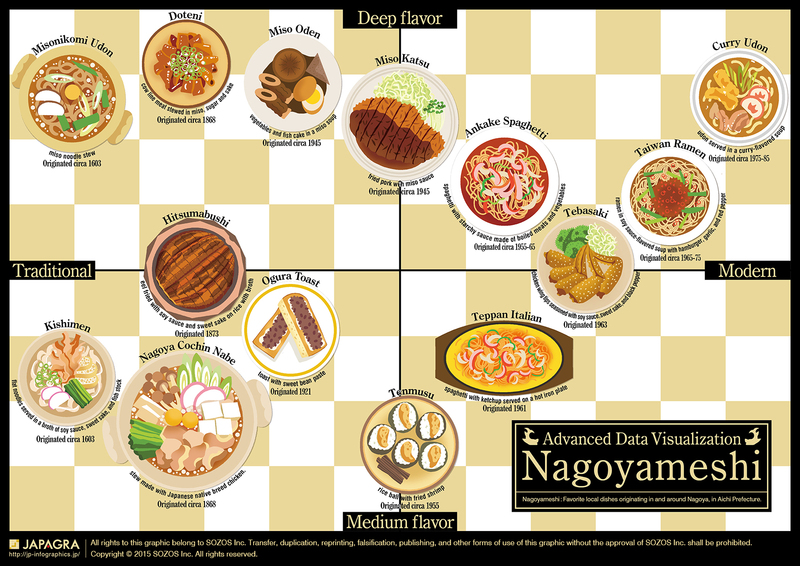 Please enjoy Nagoya’s many specialty dishes in one of her wonderful local shops when you visit! * “Umami” is a fifth basic taste, pleasant and savory, named by a Japanese professor, joining the ranks of sweetness, sourness, bitterness, and saltiness. – The origins of Kishimen and Misonikomi Udon are open to debate. For the purposes of this article, we refer to the opinion originating in the Edo era. 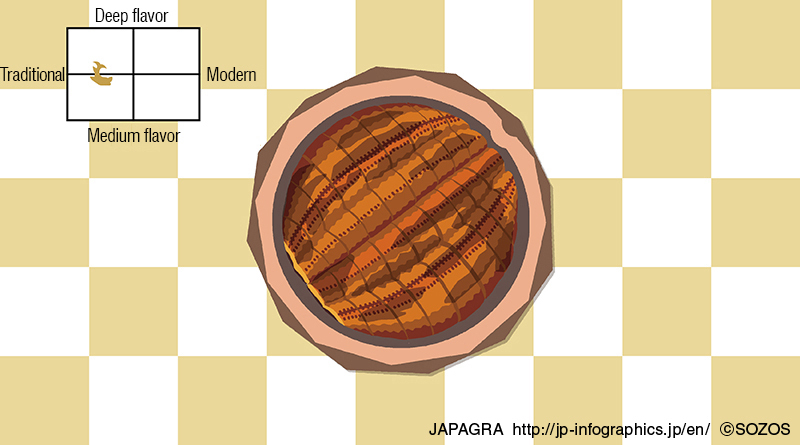 – The term ‘Nagoya Kochin Nabe’ was coined in the same era the Nagoya Kochin breed was introduced. *All rights to this graphic belong to SOZOS Inc. Transfer, duplication, reprinting, falsification, publishing, and other forms of use of this graphic without the approval of SOZOS Inc. shall be prohibited. Copyright 2016 SOZOS Inc. All rights reserved.